Emperor Augustus had set the natural boundaries of the Roman Empire as being the Rhine, the Danube and the Euphrates. This policy had been abandoned by Trajan in his conquests of Dacia, Armenia, Mesopotamia, and Assyria. 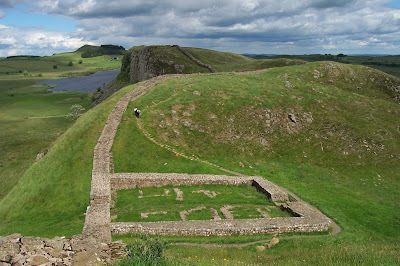 On taking possession of the imperial power Hadrian at once resumed the policy of the early emperors, and devoted his attention to maintaining peace throughout the world, for the nations which Trajan had conquered began to revolt; the Moors, moreover, began to make attacks, and the Sarmatians to wage war, the Britons could not be kept under Roman sway, Egypt was thrown into disorder by riots, and finally Libya and Palestine showed the spirit of rebellion. Whereupon he relinquished all conquests east of the Euphrates and the Tigris, following, as he used to say, the example of Cato, who urged that the Macedonians, because they could not be held as subjects, should be declared free and independent. After stabilising his imperial status in Rome, Hadrian travelled to the provinces of Gaul, and came to the relief of all the communities with various acts of generosity; and from there he went over into Germany to examine the state of the military. Having reformed the army quite in the manner of a monarch, he set out for Britain, and there he corrected many abuses and was the first to construct a wall, eighty miles in length, which was to separate the barbarians from the Romans. This fortification extended from Wallsend at the mouth of the Tyne to Bowness on the Firth of Solway, a distance of 73.5 English miles. Its remains show that it consisted of two lines of embankment with a moat between them, and a stone wall running parallel on the north. In the space between the embankment and the wall were small strongholds about a mile apart with an occasional larger stronghold, all connected by a military road. After arranging matter in Britain Hadrian crossed over to Gaul, for he was rendered anxious by the news of a riot in Alexandria, which arose on account of a living manifestation of the bull god Apis. After this he travelled to Spain where he restored a temple to Augustus and extracted a levy from the natives and the Italian settlers who were previously exempt. 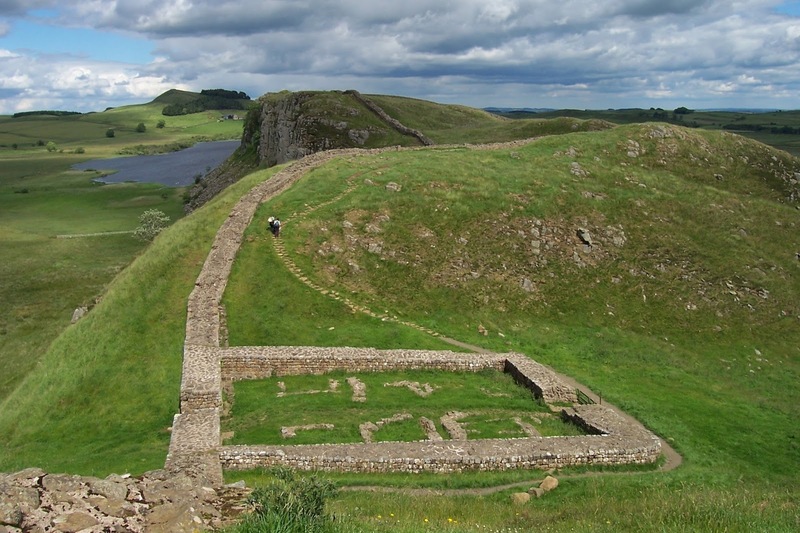 During this period and on many other occasions also, in many regions where the barbarians are held back not by rivers but by artificial barriers, Hadrian shut them off by means of high stakes planted deep in the ground and fastened together in the manner of a palisade. Just such a palisade has been found on the German frontier where the rivers Main and Neckar do not constitute a natural boundary. He appointed a king for the Germans, suppressed revolts among the Moors, and won from the senate the usual ceremonies of thanksgiving. The war with the Parthians had not at that time advanced beyond the preparatory stage, and Hadrian checked it with a personal conference. After this Hadrian travelled by way of Asia and the islands to Greece, and, following the example of Hercules and Philip, had himself initiated into the Eleusinian mysteries. He bestowed many favors on the Athenians and sat as president of the public games. And during this stay in Greece care was taken, they say, that when Hadrian was present, none should come to a sacrifice armed, whereas, as a rule, many carried knives. Afterwards he sailed to Sicily, and there he climbed Mount Aetna to see the sunrise, which is many-hued, they say, like the rainbow. Thence he returned to Rome, and from there he crossed over to Africa, where he showed many acts of kindness to the provinces. Hardly any emperor every travelled with such speed over so much territory. * The post above quotes the linked text, but combines information from the footnotes with selected passages from the translation of the Life of Hadrian to present a coherent account of his work on border maintenance. The 'slash in the trees' and a Canadian border post, a few miles west of the eastern railway crossing. Perhaps you thought the border between the United States and Canada was thoroughly invisible boundary line, something as theoretical and imaginary as the cordon between the Eastern and Central Standard time zones. Well, you would be wrong. I already knew this, since I'm planning to cross the border by train this summer. I know I need to send Amtrak a copy of my passport number well in advance, and also that the border adds a couple of hours to an already very slow journey. With Google Maps you can see border posts and even concrete bollards blocking what should be minor residential roads. But that's not all. Much of the US-Canadian border runs through water or forest. 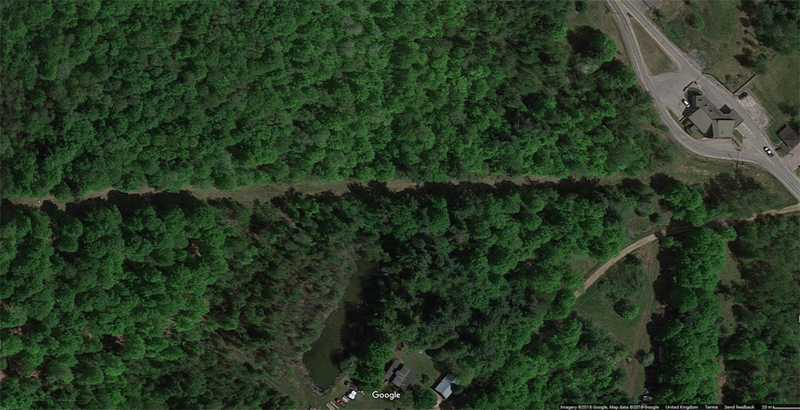 Through the latter, there is a 20-foot wide corridor carved through the trees for 1349 miles. US and Canada share the task of keeping this line free of trees, in a monumental 15-year cycle of bush clearance. Lest visitors think the 20-foot-wide endless lane they just discovered in the northern woods is some kind of installation art or strange land-management practice, the IBC has placed 8000 monuments and reference points along it indicating the international border. It's easy to see why people might be confused otherwise. "The purpose," Hipsley (then Acting Commissioner of the US International Boundary Commission) explained genially, "is so the average person... knows they are on the border." And the reason you would want to know that? "If you cross it and are caught, whether you intended to or not, you can be fined a substantial amount - so it's important," Hipsley warned. Actually, Hipsley is really good at telling it like it is. Here he explains the all-important relationship between borders and regulatory divergence. Brexiters (forced or voluntary), take note! "It's still important, because we [the U.S. and Canada] have different governments with different policies on farming and timber management." 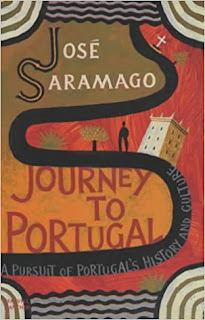 In 1981, Portuguese author José Saramago published Journey to Portugal, a thorough exploration of his home country. Nowhere does he display more faux bewilderment than at its borders, with their history of incomprehensible skirmishes, their land owners who answer to both Portuguese and Spanish administrations, their workers to whom the border represented a living and those others to whom it represented an obstacle on the way to work, their citizens - and fish - with undefinable national identities. In this repeated stumbling against the paradoxical border, Saramago continually re-opens the question of whether his project of even makes sense. Five years later, Portugal joined the EEC. In 1995 it joined the Schengen area and the borders started to come down. 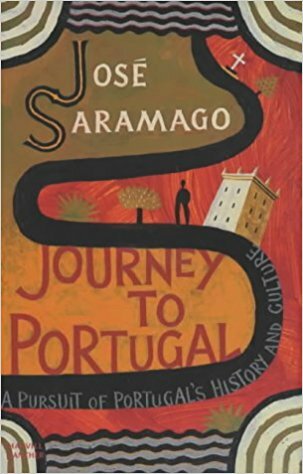 Journey to Portugal's opening passages, in which Saramago ceremoniously re-enters the Portuguese nation at its north-eastern border, form an amusing memorial to something that should remain a memory. "Nothing of the kind had occurred within the living memory of any border guard. This was the first traveller ever to pull up in his car, with the engine already in Portugal but the petrol tank still in Spain, and lean over the parapet at the precise point crossed by the invisible line of the frontier. Then, from across the deep dark waters, echoing between the tall rocky slopes on either side, the traveller’s voice could be heard preaching to the fish in the river. This was a fine miracle with which to start the journey. A sudden breeze ruffled the waters, or perhaps it was simply the disturbance caused by the submerging fish, for no sooner had the traveller fallen silent than there was nothing to be seen apart from the river and its shores, and nothing to be heard above the dozy hum of the car engine." "In the wake of the EU referendum, the United Kingdom's border with Ireland has gained greater significance: it is set to become the frontier with the European Union. 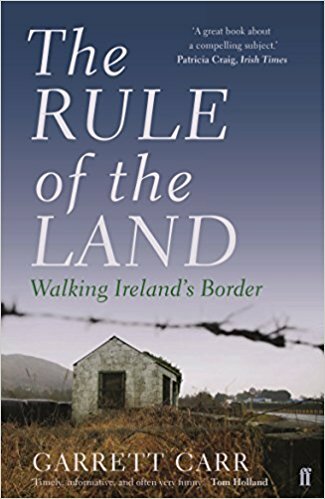 To uncover its secret landscape, with a troubled past and an uncertain future, Garrett Carr travelled Ireland's border on foot and by canoe. This invisible line has hosted smugglers and kings, runaways, peacemakers, protesters and terrorists, revealing the tumult of a border, changing the way we look at nationhood, land and power." "The line [of the Irish border] itself is invisible, although usually following a feature, often a hedgerow or stream. I found many unofficial crossing places, wooden footbridges and new paths, and I felt north and south were getting to know each other again. There were also major road bridges that were so fresh they weren't yet on Ordnance Survey maps. "For years and years I lived in a cul-de-sac," a woman told me at her front gate, "but the new bridge was put up and I can go either way now." The Good Friday agreement is 20 years old, and the bridge across the Blackwater river, only a few hundred feet from her house, was then eight years old. She could remember when it was opened. "It was bizarre really," she said, "I'd dander over and meet people I hadn't seen in years." Ireland's border has been associated with crime, be it smuggling or terrorism. I can report my most dangerous encounter was with a goat." Thanks to the EU, the activity once criminalized as 'smuggling' had become perfectly legal commerce and the incitement to terrorism had been removed. In a single, brilliant paragraph, Carr sums up the freedom from personal and community-based identity provided by the EU umbrella. "You did not have to pick one of two sides any more. Most people moved towards areas of consensus, the value of peace and an open border. "Sure there is no border any more," one farmer told me. Strictly speaking this was untrue, and he was actually pointing towards the border at the time, where it ran with a river along the bottom of his field, but it was true enough that he could make the claim with confidence. The border is not there is your identity prefers it absent. on the other hand, if your identity depends on the border, then it is there for you." "So it took Yvette Cooper to get forensic by pointing out that the prime minister's solution of the Northern Irish border had been to propose that 80% of traffic should be allowed to get away with smuggling cows, pigs, grenades and guns." Our daughter is over 15 and we just got the formalities for her birth completed! I love the way the title of this post sounds like a tabloid headline. Unfortunately, the little story it contains may seem long and tedious in parts, so please remember that it represents a routine type of occurrence in the international lifestyle. And yes, it is long and tedious. When we got married, in a small village in the French mountains, we were still British and American respectively, and not French as well. On that occasion, we were presented with a little booklet known as the 'Livret de Famille'. The French state came up with the idea of a Livret de Famille in 1871 because it had just lost a whole bunch of important documents in a fire. Lots of people found themselves with no proof of their marriages or the births of their children and like anyone else who belatedly realizes the importance of backups, the state decided it would be a good idea to distribute copies of the evidence around the place, specifically to the most interested parties. It was such a good idea, in fact, that a penalty was imposed for not keeping the Livret de Famille up to date. Ours therefore repeated the information from our own birth certificates, confirmed our marriage, and provided more than twenty blank entries for the purpose of recording the births and deaths of the fruits of our unions. Such was life was back in 1871. In due course, the traditional stork arrived bearing a little bundle, not to the little French village, but to a pleasant suburb of London, for reasons I may explain some other time. The bundle received a British birth certificate and we figured it would be soon enough to get the Livret de Famille filled in when we got back to our village three months later. The Americans, we thought, could safely be allowed to wait even longer. Maybe I'll tell you about them some other time as well. The trouble started when we got back to the village. The mairie said they could only fill in the Livret de Famille for children who were born locally. If a child was born in London, it was the job of the French Consulate to fill it in. The French Consulate said, reasonably enough, that they could only fill in the Livret de Famille for children of French nationality who had been born in London. Nobody, it seemed, was willing to fill in the entry that had to be filled in under pain of sanctions. We let it go, even though we suspected it would come back to haunt us. When we tried again, some years later, after we had all became French, the French Consulate of London admitted that it really only recorded the births of French children born in London who had been French at the time of their birth. There is some justice in the fact that they were the ones who had to deal with us when the haunting began five years later. We were in London again for a while and had taken our daughter out of school for half a day to try to renew her French passport. The first one had been issued by a nice chap in the district office near our village, who said she should be in the Livret de Famille really, but he could see our difficulty. Now, the French Consulate began to see our difficulty also. They couldn't possibly issue a passport to a child who wasn't in her parents' Livret de Famille. They couldn't possibly write her into the Livret de Famille . They couldn't possibly argue that she couldn't have a passport. Perhaps we should fill in an application to get them to put her in the Livret de Famille and see what happened. What happened is that a few weeks later, they sent the application back, assuring us that they still couldn't put her in the Livret de Famille but perhaps if we sent the application to France's 'Home Office' in Nantes? We figured out a way to buy French postage for the return envelope while living in the UK and sent our paperwork off to Nantes. Two months later, I called them up to see how they were getting on. In the first place, the office in Nantes assured me that they never had anything to do with filling in Livrets de Famille. At that point I insisted, which is a verb describing the usual approach of a French citizen who hopes to get somewhere in their relations with the administration. Recognizing the ploy, the person on the other end of the phone admitted that writing our daughter's name in the Livret de Famille might conceivably be their job. Of course, a few months later, they send our paperwork back on a technicality, and we sent it back to them, which is why nearly a year has gone by since we first tried to renew my daughter's passport. It's almost exactly fifteen years since we first tried to fulfill our administrative duties with respect to the French state. Our daughter's entry in the Livret de Famille is a pretty mundane thing in ordinary black pen, with a nearly invisible stamp. Need I emphasize that the temptation to do the obvious occurred to us quite regularly over the last fifteen years? Oh well, now we just have to go through the rigmarole of applying for a passport all over again. This is where we are - Lala Land, Helsinki. We like Helsinki: it's cold, the food is good, the hotel is great and there was a Crocs shop. Now we have to go, so I'll explain about how we didn't really escape the Brexiters in a bit. So the barman in the hotel in Helsinki is from a little village in Kent, but he's been living in Finland for 9 years. He turned out to be a perfect example of the obliviousness people can display to the way their lives are shaped and supported by institutional underpinnings. Our barman is a Brexit supporter. We found this out because we started off commiserating with him on the grounds that he was surely going to have to start Finnish residence or citizenship proceedings. He said he wasn't going to do that and doubted he could pass the language test anyway. Well yeah, Finnish has a reputation! So we asked him if he was going back to Kent and he said, oh, no, he was staying right where he was. It's not like they were going to kick anyone out of Finland, really they weren't. Huh? 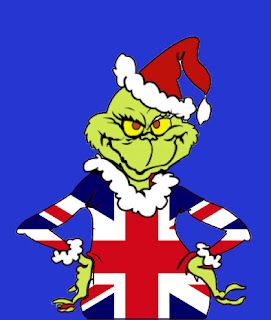 They might not send the deportation van round on the day Britain formally leaves the EU. They don't need to. Let's just start with what we all know: this man has an employment contract that depends on him being an EU citizen. If nobody does anything, his employment contract will become.... 'non-legal' the day Britain leaves the EU. Perhaps his boss, who knows him, will not want to fire him. Perhaps the Finnish government, despite no doubt having better things to do, will pass a law saying that existing contracts with British citizens are valid. What then? Not many people stay in the same job for ever these days: those contracts might be good right up until the moment he wants to change jobs or gets fired. Or promoted, even. At that point, without some sort of Finnish immigration proceedings, there is no reason to suppose he will be able to enter into a new contract. There would be nothing to distinguish him from someone who arrived from Britain a few days ago, and the whole point of Britain leaving the EU is to curtail the freedom of movement of people. The movement of Eastern Europeans to Britain principally, but by the inevitable law of reciprocity, people like him. If Finland wants Britons like him, they will have to create a whole new administrative underpinning form them, or assimilate them into the immigration systems they already use for non-EU citizens. What would happen otherwise, they day he decides to go and visit his dear old mother in Kent? When he tries to return 'home' to Finland, he will have to go through immigration as an 'Outsider'. 'How long are you staying?' 'Oh, I live and work here,' will not be an acceptable way for that conversation with border control to go. Without a work permit, there will be nothing to distinguish him, a person who exercised bona fide treaty rights, from a Briton who has no expectation of entitlement to live and work in Finland. Even worse, all over Europe, all those databases which are programmed to treat the nationality code 'GB' as 'One Of Us' will flip over to 'Treat As Outsider'. Without some form of immigration proceeding, this can affect Britons in Europe in every part of their administrative lives: health, social security, education, legal rights, and in a way that is often completely automated and gives them no recourse through interaction with a human being. It is true that few politicians, in Britain or the rest of the EU, want this outcome. It is also true that they are going to have to do time-consuming political and institutional work to save the rights of a greater or lesser number of people, depending on the state. Britain has proposed sorting out the issue of Europeans in Britain and Britons in Europe early in its departure negotiations. It is easy for Britain to propose this, because immigration to Britain falls within their jurisdiction. In the past, the EU has not had much to do with immigration policy of non-EU citizens in the member states. It is not clear to me that they have any standing to negotiate on this topic. It might be up to each member state individually to decide what provisions they want to make for Britons. We don't know yet. Whether the EU decides collectively or the member states decide individually, it's almost certain that the most Britons in Europe (or Europeans in Britain) can expect is form of accelerated, and possibly easier than usual immigration procedure. Whether they will waive their usual language or culture test, their fees, or any of their administrative red tape is a moot point. Most of us are not counting on it. It seems quite possible to suppose that they will take the opportunity to repatriate anyone who has a criminal record, looks insolvent, or has failed to learn the local language after nine years. We consider that so likely that as we parted we automatically wished our barman luck in getting to grips with Finnish at last. Hi y'all. This is going to be one of those live-blogging thingies. When all your Christmas presents for the foreseeable future consist of packets of paperwork, expense, bureaucracy and uncertainty as you struggle to save some shreds of the rights you cared about and had based your life around, (thank you, Brexit Grinch), it puts you right out of the mood. Consequently, we are attempting an escape to Finland. 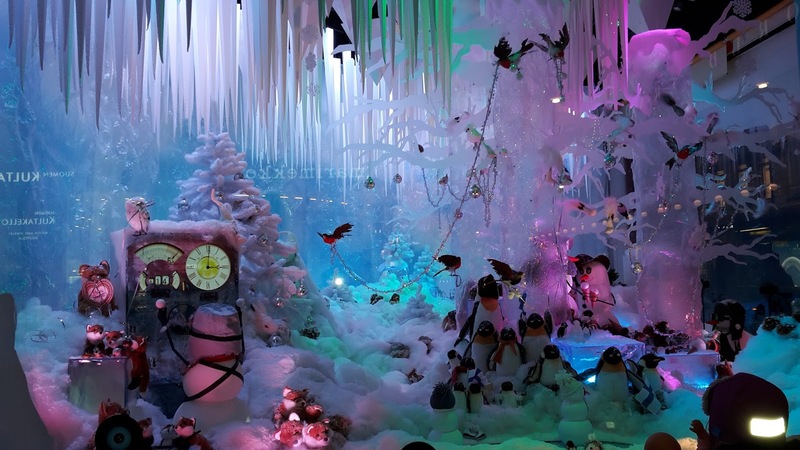 What Christmas is really about is Midwinter, so where better to go than the Arctic Circle (nearly). There are no guarantees of success here, what with strikes, winter weather, technical problems on the London Underground, human error, etc, etc. Let's see how this goes. Darned expensive, but since I often organize our trips myself, I have some insight into what I'm paying for. They made it easy. I wouldn't trust these clowns to fork out a cent, but at least they didn't charge us much either. I followed the application instructions, submitted a request over a month in advance and received no response, so I assumed there was no problem. That's how it's always been in the past. In the middle of the afternoon the day before our departure, I received a letter saying the request was refused! WTF!!! If they told me even one week ago, I could have arranged a car pickup from the school. Too late now. I emailed them to tell them it was no longer possible to adapt our plans and requested an explanation. But I already know what the explanation is. This is just the kind of efficiency and regard for the impact of decisions that Brexit Britain is teaching us to expect. Clockwork. One hour and a half of clockwork. Go TFL! I think it was 10 minutes late, but it arrived early so who cares. 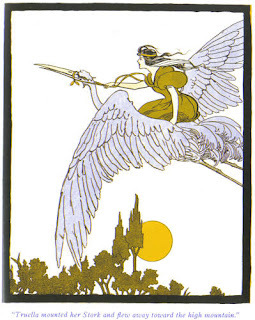 God, but flying is just the suckiesr form of transport. It would be bad enough without turbulence, but there was turbulence. Also the food. We did not expect much, but since we paid 10 GBP per meal, I thought it would be at least as good as when the food was free. Instead, it was so spectacularly bad it was almost a work of art in its own right. Next time we come to Helsinki (next summer) we plan to do by train and boat. Never mind if it takes a week. Because it wouldn't really count as an escape if it didn't. As mentioned above, it was early, but it loses one star because the passengers shouldn't reaaly feel that relieved.